The weather announcer guy/lady was always right. In a time in which I didn't understand how the whole 'predicting of the weather' and 'chances of so-and-so' system worked. If they said it was gonna rain, it would rain. If they said it was gonna be sunny, well then. Sunshine all round! For some reason smol-me didn't particularly like the amount of power that they wielded, and how they wielded it. Hence, I was downright overjoyed when I woke up one morning to see that the weatherman's forecast of a sunny day was completely wrong. It was, in fact, raining cats and dogs. Thinking back, I probably misheard it-- but that didn't stop the little ol' smug-me from bounding up to my mum and announcing the weatherman had made a mistake. It also taught me to start taking things with a grain of salt-- probably much to my Mum's annoyance whenever she was trying to teach me stuff. Every live-action movie was 'Live'. ...In which the very second the VCR (the old version of DVDs, for you youngin's) went in, and it went to the menu-- there would be a tiny signal sent off to a studio that would set off an alarm, and the actors would all have to scramble to to their places to peform the whole thing over again.... for the rest of their lives. OKAY BUT I HAD A REASON FOR THIS ONE. Basically I sometimes noticed different lil' things each time I watched a movie. Now of course that's pretty normal, as I was probably focusing on a different part of the screen or character once in a while.... But no. Babies... were made by a kiss (on the lips) between a Mum and Dad. So first of all... Apparently not. This one was just more of a guessing game for me. I quite enjoyed coming up with completely innocent theories (and possibly the most embarrasing one) for the magical appearance of a baby human in the family. Forget storks. That was an obvious lie made up by parents to throw curious kiddos off the trail of discovery. Unless they were like my parents, who pressed the 'panic' button and took the classic: 'I'll tell you when you're older' escape route. When someone falls asleep at night, they immediately start the next day before anyone else. Sooo this one's semi-hard to explain. Basically whenever my siblings fell asleep before me, I instantly thought that they must have woken up in 'tomorrow morning'. I also had a small tendency to sleep in... (Heh, still do. Something I need to fix.) hence, when I finally managed to fall asleep and wake up-- they were already there and doing stuff around the house. By seven years old, I kinda knew it didn't make any sense, but I still liked to think about it often. *cue me poking my sister's cheek as she slept* I wonder what she's having for breakfast right now. ...I didn't have an explanation for naps. Gosh, that is great. 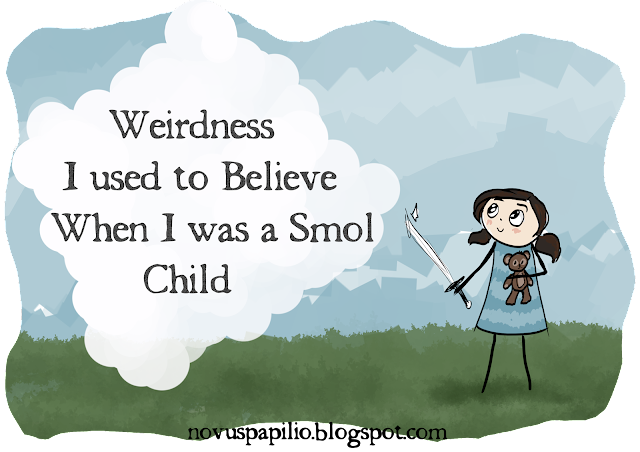 I had an imaginary friend/pet.... ummm... There were a lot of song lyrics I never heard right and so thought they were completely different.... what a surprise when I finally looked them up or heard them right... I can't think of anything as good as what you have here, 'specially about waking up in tomorrow, that is adorable! This is an awesome post, Sarah! :) I love the one about live action movies being live, and the actors being stuck on the movie forever!! Oh my woooord. XD XD These are all hilarious. Personally, I used to think that the sound of the highway + mines coming OMINOUSLY FROM THE DIRECTION OF THE BIG DARK FOREST across the road. Was, of course, A BEAR. So if it ever got particularly loud while I was outside I'd scurry to hide behind a bush or something and just peer toward the trees trying to see the bear. ..I think I remember doing something sorta similar... Except I usually would just freak myself out for no reason with my over-active imagination-- while walking around somewhere dark, of course.